More and more science is finding the importance of protecting headwater streams for aquatic ecosystem health, biodiversity, and downstream water quality and drinking water protection. In this research note, USDA Forest Service ecologists examined the effect of variable-width buffers greater than 50 ft (15.24 m) on non-fish-bearing streams. This has implications for improving stream protection in our active forestry areas, where there is very little protection for small streams and wetlands. Since the Northwest Forest Plan implemented riparian buffers along non-fish bearing streams in 1994, there have been questions about how wide those buffers need to be to protect aquatic and riparian resources from upland forest management activities. The Density Management and Riparian Buffer Study of western Oregon, also initiated in 1994, examines the effects of thinning and different buffer widths on aquatic and riparian vertebrates and habitats, tree growth, and vegetation along headwater streams. Dede Olson, a research ecologist with the Pacific Northwest Research Station, leads the riparian component of the study. Olson and her colleagues found that aquatic and riparian species and habitat were retained with no-entry, 50-foot minimum variable-width buffers. Their research has characterized both aquatic and terrestrial amphibian assemblages that rely on headwater streams and near-stream riparian forest habitats. For example, they documented that terrestrial salamanders have heightened movements within 50 feet of headwater streams. By extending such buffers along headwater streams over ridgelines, landscape connectivity could be provided, enabling gene flow among populations of terrestrial salamanders. From POLIS Water Sustainability Project: Last week, the WSP released the new research report Awash with Opportunity: Ensuring the Sustainability of British Columbia’s New Water Law. Authored by POLIS researchers Oliver M. Brandes, Savannah Carr-Wilson, Deborah Curran, and Rosie Simms, the report outlines what is needed to put the “sustainable” in the Water Sustainability Act. With the new Water Sustainability Act replacing the 106-year-old Water Act in 2014, British Columbia has a once-in-a-lifetime opportunity to modernize its freshwater legislation and usher in a new era of water stewardship. The Water Sustainability Act has many promising features that can better protect the province’s fresh water. Yet full implementation of the new Act hinges on passing critical supporting regulations that will provide the necessary details to make the Act fully functional. British Columbia’s fresh water is under pressure from an array of threats, including climate change, population growth, and escalating and competing demands for water. Conflict and concern mounts as watersheds across the province show signs of stress and pressure from unprecedented droughts. Water quality degradation and skirmishes over water use increase the urgency to act. A comprehensive water law regime that includes a fully implemented Water Sustainability Act and a full suite of supporting regulations is a necessary condition to ensure that future water challenges do not become debilitating water crises. The report specifically offers the Provincial government the necessary advice and insights needed to move beyond crisis response toward a fresh partnership approach with shared roles and responsibilities to protect B.C.’s water resources—now and into the future. For more information, see the November 16th front-page article in The Province, which discusses the Government’s recently announced water rates and the findings of the new report; Rosie Simm’s discussion of the new report with Victoria’s CFAX 1070 on November 21st, or the forthcoming article, written by the report’s co-authors, in the Winter 2015 issue of BCWWA’s Watermark magazine. The Shoreline Master Program (SMP) is a combination of planning and regulatory documents. SMP documents carry out the policies of the Shoreline Management Act (SMA) (RCW 90.58) on local shorelines. Local governments are required to prepare SMPs based on state laws and rules. SMPs are prepared to implement the SMA to prevent, “harm caused by uncoordinated and piecemeal development of the State’s shoreline.” Local SMPs are tailored to local geographic and environmental conditions, as well as to existing and future planned development patterns within the shoreline. The SMP update process balances and integrates objectives and interests of local citizens. Key principles of the SMP include striking a balance among environmental protection, public access and water-oriented uses, and achieving “No net loss” of ecological functions. The Ferry County Planning Commission and City of Republic are holding a public hearing to review the proposal to adoption the new SMP. Wednesday, December 9, 2015 at 6:00 p.m. 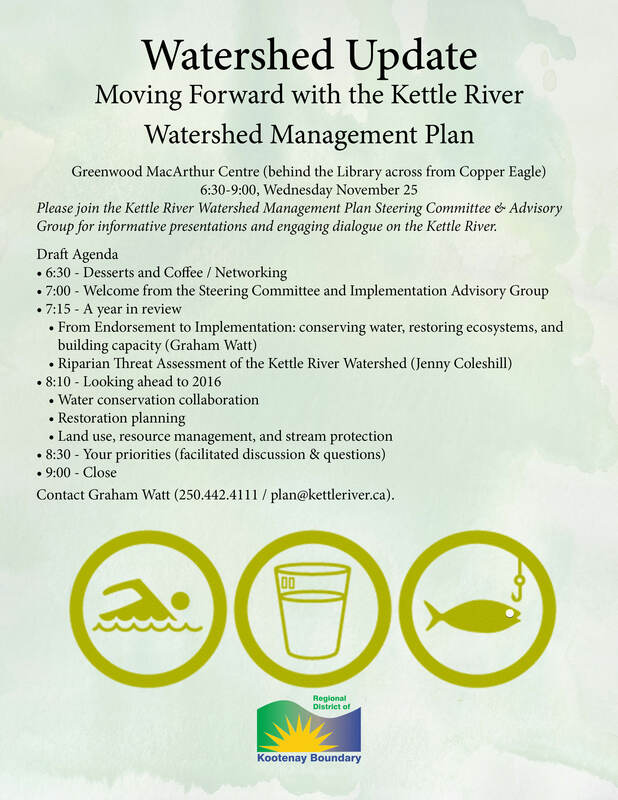 Please join the RDKB Kettle River Watershed Management Plan Steering Committee and Advisory Group for informative presentations and dialogue – and dessert! Greenwood MacArthur Centre November 25, 6:30-9:00 p.m. Contact plan@kettleriver.ca for details.